Later this week, there’s a Full Moon in your opposite sign Scorpio, which should do a nice job of bringing a particular discussion to a climax. Or is it an anticlimax? Here’s a clue, if you happen to remember all the way until Saturday when things get interesting. There’s an entire point of view missing from the discussion. 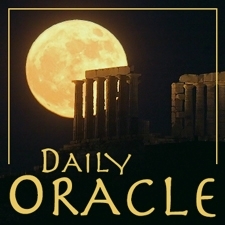 Today’s Oracle takes us to the Taurus weekly for May 12, 2006. Later this week, there’s a Full Moon in your opposite sign Scorpio, which should do a nice job of bringing a particular discussion to a climax. Or is it an anticlimax? Here’s a clue, if you happen to remember all the way until Saturday when things get interesting. There’s an entire point of view missing from the discussion. Those who are involved, including yourself, have a pretty firm idea of what the situation is supposed to be about. All the viewpoints involved seem to be intractable, and at the same time, they are all subject do an odd kind of doubt. Something is missing. The salient theme or issue has not, actually, been raised before — but if you think, you’ll know what it is.